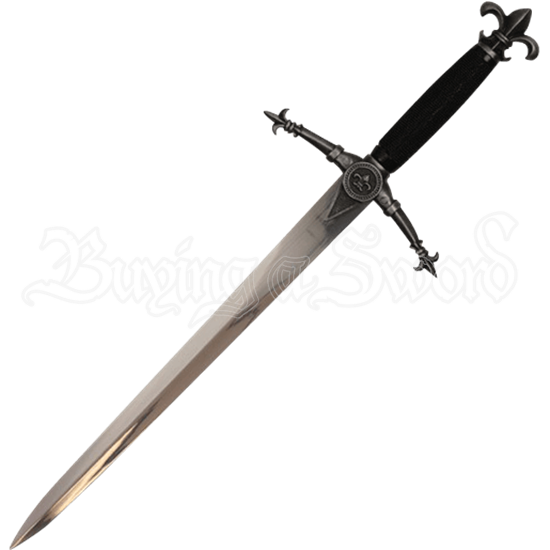 With elegance and poise, the Decorative Fleur De Lis Dagger is a beautiful take on medieval weaponry. Made ornate through its embellished hilt and included scabbard, this decorative dagger features fleur de lis details throughout. Made of stainless steel, the traditional spear point dagger is attached to a steel and plastic hilt. The steel guard features upwards pointed arms that end in fleur de lis symbols, and the center of this guard displays a round fleur de lis crest. A fleur de lis shaped pommel follows the rounded, high gloss black plastic grip. A matching black plastic scabbard comes with this decorative dagger, itself adorned with fleur de lis detail on its throat and endcap while its length displays a wrapped faux leather look. Whether you add this beautiful medieval dagger to your collection, gift it to a friend, or display it as a unique statement piece in your home, the Decorative Fleur De Lis Dagger will charm and impress with its detail and craftsmanship.